Scritto il 18 Agosto 2016 . I said it out loud, as though I were passing along common sense sage wisdom to my ten-year old. But, as I heard the words, they sounded strange, wrong and dismissive in the way that phrase has always reached us. 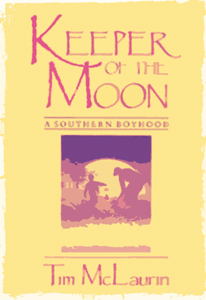 But that’s what went through my head, reading Keeper of the Moon, a southern memoir, on the train to work. I read of Michael, Bill’s fecklessly wayward son, and I had to smile, though it stung old and sharp. At the station stop I looked out of the window. A chain link fence, inches from a door on an old brownstone. Something from Escher, it looked impossible to enter or exit the building there, and it looked as though no one had for years. These things happen, I thought. Buildings are constructed, lives enter and leave inside them. Sons rocked and put to bed and the chills find them through the cracks. Sons, raised in the ways a father hopes are still good and right, still usable in a world no longer understood. Michael, the shy one, not imbued like his father with a silver tongue and a head that meant business. Michael retreats, or tries to, but the town is smaller than the forests he wanders after school, and we all come to learn that you can’t hide forever. But a father now myself, I see the other side. A father feeling compelled to guide, almost to understand, lead his son in the ways that must serve him in everything that waits. So he searches for the boy among the trees, pulls him from his Walden, so that he doesn’t waste valuable time preparing, training to catch the speeding world and take his place within it. But the boy. I remember that, too. He can’t be expected to understand. The things you do to keep the engine running, the thing you have to be willing to toss over to stay afloat. You move where the street names get stranger, the neighbors louder and closer. I want the father to say this to Michael, make some kind of connection so that he doesn’t recede into the shadows of the woods, confused and hurt, one day not to be seen at all. But he doesn’t. He never does. These things happen. The distance between kin, between the woods and the home, generations that ponder one another in stumped joy. Between a middle-aged man on his way to work and the what ifs that spread like weeds. The space between fence and an old tenement, where Goodwill curtains seen from a train never open. Where doors can be left unlocked, but are never opened again.